6 Essential Tips For Watering Your Lawn | Maple Leaf Lawncare Inc.
Water is essential to all life…too little water and we die, too much water and we drown. The same is true of the grass in our lawns. Water makes up 70% to 80% of the weight of grasses and the clippings alone are nearly 90% water. While most people are concerned about not watering their lawns enough, the fact is, more lawns are damaged by overwatering. It is essential to begin watering new turfgrass sod within a half hour after it is installed or placed on the soil. Apply at least 1 inch (2.5 cm) of water so that the soil beneath the turf is very wet. Ideally, the soil 6 inches (15 cm) below the surface will be moist. Pull back a corner of the turf and push a screwdriver or other sharp tool into the soil. It should push in easily and have moisture along the first 6 inches (15 cm), or you need to apply more water. Make certain the entire lawn is receiving water. Corners and edges are particularly vulnerable to drying out and are easily missed by many sprinklers. These sections dry out faster than the center portion of a new lawn. Areas near buildings also dry out faster and may require more water. Runoff may occur on some solid or sloped areas before the soil is adequately moist. To conserve water and ensure even irrigation, turn off the water if runoff begins. Wait 30 minutes to an hour and restart watering. Repeat as needed. For the next two weeks (or until the turf is well rooted), keep the soil below the turf mosit with daily (or more frequent) waterings of approximately one-quarter inch (0.6 cm) each. Increased watering may be required during hot, dry or windy periods. As the roots of the turf begin to penetrate the soil, it will be difficult to pull back the corner to check beneath the turf to see if water is penetrating the soil, but you can still use a sharp tool to check moisture depth by pushing it through the turf and into the soil. Water as early in the morning as possible to take advantage of the grass’s normal growing cycle. Morning is ideal because of the lower wind speeds and less water is lost to evaporation. Watering in the evening is discouraged because water remaining on the grass can promote disease and fungus. 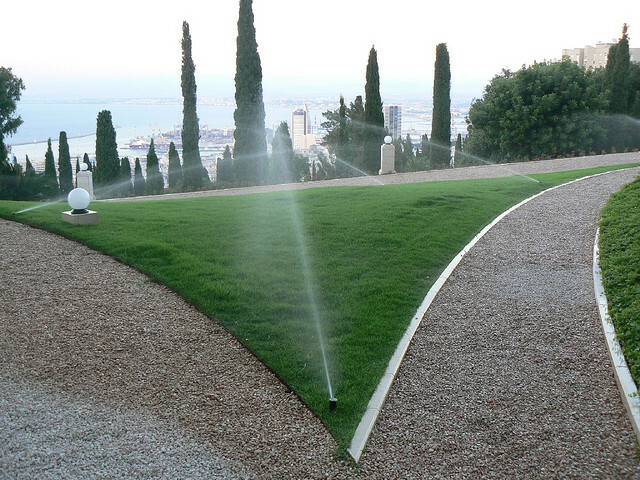 Infrequent and deep watering is preferred to frequent and shallow watering. Roots will only grow as deep as their most frequent available water supply. Deeply rooted grass has a larger “soil-water bank” to draw moisture from and this helps the grass survive drought conditions and hot weather that dries out the upper soil layer. During the remainder of the growing season, most lawns will do very well with a maximum of one inch of water a week from either irrigation or rainfall. Soil conditions may dictate irrigation be applied in two seetings, approximately two to three days apart. This amount of water is all that is required for healthy grass, providing it is applied evenly and wets the underlying soil to a depth of 6 inches (15 cm).